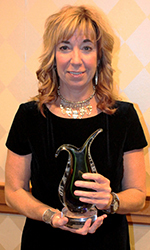 The Pennsylvania Pharmacists Association (PPA) recently recognized Holly Lassila, BSPharm, RPh, DPh, MSEd, MPH as the winner of the NASPA Excellence in Innovation Award sponsored by Upsher-Smith Laboratories, Inc., during PPA's 2016 Annual Conference held at the Crowne Plaza Philadelphia- King of Prussia on September 24, 2016. The Excellence in Innovation Award recognizes a pharmacist who is involved in an innovative pharmacy practice resulting in improved patient care. Lassila's clinical practice, which is based in behavioral health, is associated with Pittsburgh Mercy Behavioral Health System and Operation Safety Net. She provides immunizations, point-of-care screening services, lifestyle recommendations, and medication therapy management/ disease state management services. She also accompanies medical residents on the Operation Safety Net medical van, an outreach program that delivers medical care to the homeless population. Lassila currently serves as an Associate Professor of Pharmacy practice and preceptor for the advance pharmacy practices experiences for Duquesne University School of Pharmacy.